This polo is as good looking as it is well made, featuring lightweight and comfortable cotton and polyester construction and stylish rib knit collar and contrast yoke overlay and sleeves. Perfect Origin wear for the discerning Blues supporter. Canterbury’s Overlay Polo is the perfect choice for anyone heading to a State of Origin match this year; a classic jersey that reflects Canterbury’s years of expertise in the manufacture of tough and durable, yet comfortable and stylish clothing. It’s built from a polyester and cotton pique blend, making it both soft and light to wear and it features the NSW team and sponsor logos, revealing its credentials as licensed supporters wear. 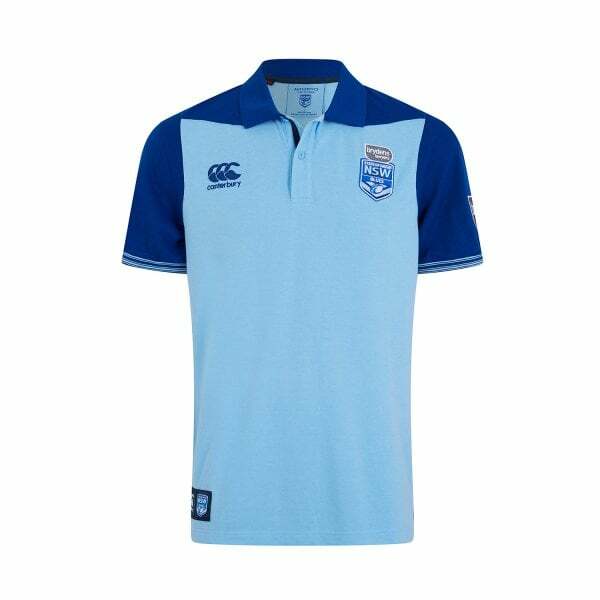 Part of Canterbury’s 2019 NSW Supporters collection, this is a garment that every Blues supporter should have and one that belongs at the smart/casual end of your wardrobe.